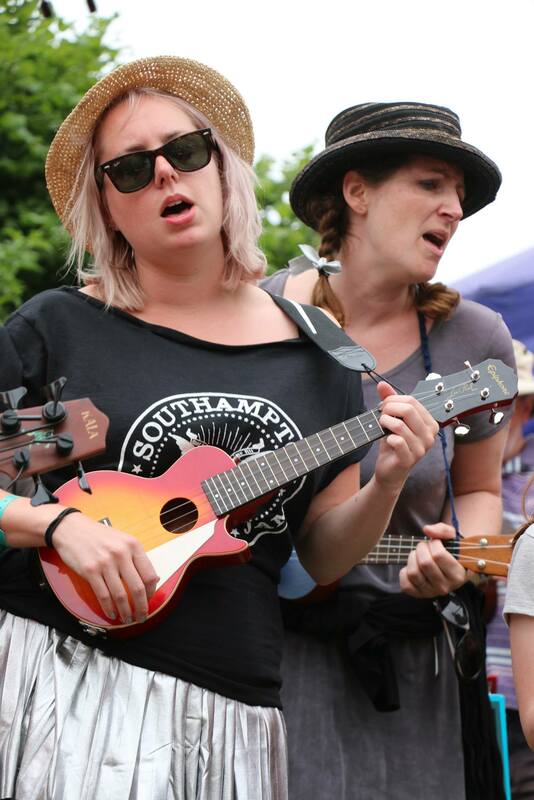 How do I join Southampton Ukulele Jam? Just come along to one of our evenings, sit down, and strum. How do I join the Beginners & Improvers Group? I don’t have a ukulele, do I need one? You don’t even need to buy a ukulele before you join in. We usually have a few spares at the Beginners and Improvers group for new beginners so you can borrow one for the evening to see how you like it. 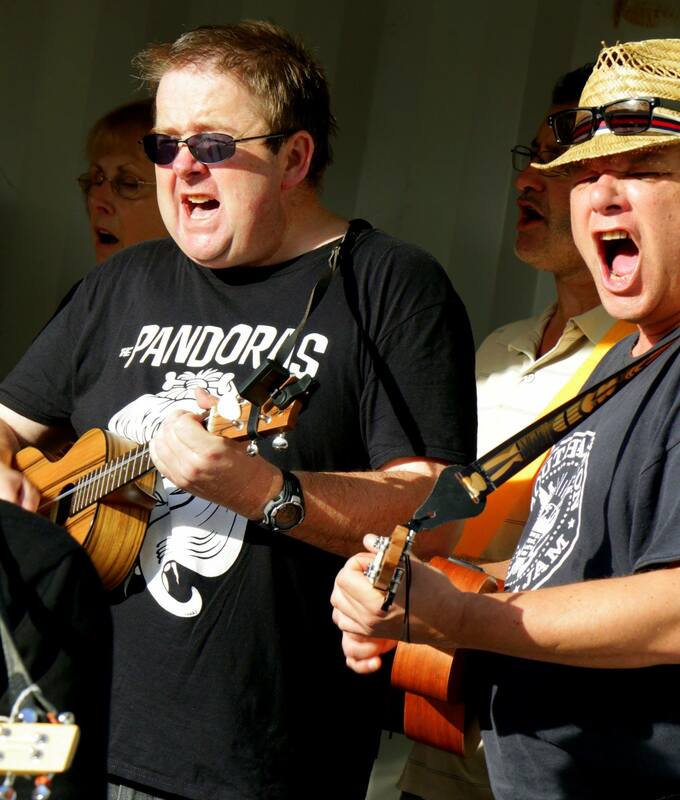 If you decide to keep coming you will need a ukulele to practise with and maybe even to play at gigs. I’m interested in joining but I am a complete beginner, how does that work? You are very welcome to come along to any of our jam evenings, but you may initially find the beginners and improvers group helpful to get you started. Each time, we have a new beginners group in which you learn three or four chords and practise songs using just those chords. We work our way through a booklet of easy songs (for which we ask a donation of £2 to a cancer charity). Once you have been to six of these sessions you will have covered all the basic chords in the booklet. After that you will be able to join in with the main Beginners and Improvers group in the bigger room. For more information about the Beginners and Improvers evenings have a look at their website. This has details of the next session and useful tips and links to various helpful websites for getting started. How can I find out what songs we will be playing? For all of the Open Jam evenings at The 1865, the Beginners and Improvers groups and upcoming gigs we usually post up a song list a few days beforehand under the calendar section of the website. For the main group sing-along at Beginners and Improvers evening we use a projector to show the lyrics and chords on a screen. Generally we don’t offer lessons, as such. The ukulele is a relatively easy instrument to get started with and once we have given you a few tips on holding and tuning, most people are able to start strumming along from their first evening. After that ‘practice makes perfect’ as they say. People who have played the guitar before tend to have no problem picking up the ukulele chord shapes (although it’s easy to get confused if you continue to play both instruments. We think that once you’ve started playing the ukulele you’ll be hooked and probably won’t want to swap back!). At the Beginners and Improvers evenings we run a separate groups for new beginners where we go through a series of very easy songs from a booklet we have available as well as groups for improving beyond strumming your first few chords. Can I bring my son/daughter/grandchild to the jam? Although the Beginners and Improvers evenings are aimed at adults, you are welcome to bring your children with you, provided they remain under your supervision throughout the evening. They may not be left unattended. Leaders of the group cannot take responsibility for children. Children over 12 can come to the Open Jam evenings at The 1865 provided they are accompanied by a responsible adult. I can’t play the ukulele, can I just come along and sing / play guitar / play tambourine etc etc? With respect, no. We are a ukulele jam. The clue is in the name. You don’t have to be any good, but you have to at least try. Maybe. We try and play as often as we can, but we can’t say yes to everything. Please contact us with details via the contact page. Can I see details of the donations you have made to charity? Yes, that information is here. Can I bring my dog/cat/budgerigar to the Jam? Can it sing and play a ukulele? I like the cowbell, do you have any song sheets with annotated parts for the cowbell ? It’s funny you should ask, we are working on some currently and when they are ready to share we’ll make them accessible here.